Is Your Organization on an Industry Hit List? You are here: Home / 1099 or W-2 / Is Your Organization on an Industry Hit List? All companies assume risks and all risks have the potential for negatively impacting the company. Where is your company’s risk-o-meter set at for worker misclassification? In Inc. Magazine, How the U.S. Labor Market Will Change in 2019, they reported that between 10 and 20 percent of employers misclassify at least one worker, according to multiple studies. Companies are expected to increase their hiring of independent contractors, or gig workers, in 20191. “THEY” are working together and aggressively looking for you! “They” are Federal and State agencies. What are they looking for? Did you know? The Internal Revenue Services and the Department of Labor have agreed to share information between the two agencies. Currently, 35 states have signed Memorandum of Understandings with Federal agencies to share information of misclassified workers.3 What this means is, if you are audited in your state by one agency and found to be in violation, the information could be shared with as many as five other agencies that will come after you for taxes, penalties, and underpaid wages/benefits. In 2018, these 13 states decided to create a task force that will end unfair labor practices and tighten the grip on worker misclassification, and they are increasing the number of audits. New Jersey Your State Next? Is your Industry on the “Hit” list? Few industries are immune to independent contractor misclassification exposure. Although companies in virtually every industry, that use independent contractors, are at risk if they have not structured, documented and implemented their independent contractor relationships in a compliant manner, the Labor Department, the IRS, and state workforce agencies have targeted certain industries where misclassification is thought to be most prevalent. Which industries are in the crosshairs of those regulatory agencies? In the past, your risk of being caught was minimal. Federal and State agencies were reactive – meaning they only acted when a complaint was filed. Today, you need to pay attention. The agencies have programs of “directed investigation” and are implementing tools to track industries and business models that have heightened levels of employee violations. There are new outreach programs to educate the worker and employer. Workers are becoming savvier and better educated, are more apt to blow the whistle on employers and initiate audits when they feel they are not properly treated. This heightens the risk to the employer for “willful” worker misclassification, resulting in higher rates of penalties and damages being assessed in misclassification audits and court awards. Minimize your risk today! 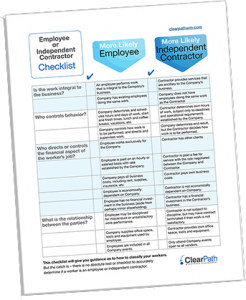 Get the Employee or Independent Contractor Checklist. Get the benefits of engaging with Independent Contractors without the potential risks. ClearPath Workforce Management risk mitigation services bridge the gap where fear of risk may prevent engagement of top talent in the gig economy. ClearPath, ClearIC™ has incorporated industry-leading technology to automate the IC compliance evaluation process, in a program managed by our experienced compliance specialists. It marries the efficiencies of an online system to collect data and documents with the knowledge and expertise to apply rationale to the data and documents collected. You get the best of both worlds: online access to a logical, easy–to–use system, as well as attention to detail and expertise. 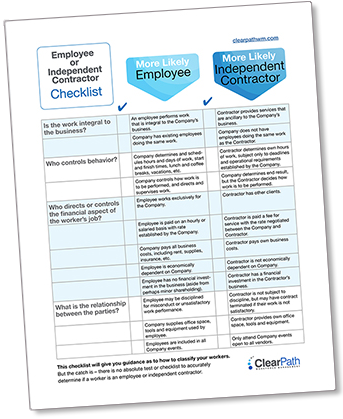 If your organization could use some assistance navigating worker classification and IC compliance, let the experts with ClearPath assist you. You can request a complimentary review of your potential risk and exposure analysis from ClearPath and put your mind at ease. Contact us to learn more about how our expert personalized service can let you get back to focusing on your business goals. Work with a leader in the industry for outsourced Human Resources and Payroll functions associated with W-2 and 1099 contingent workers. Let ClearPath be the path to your peace of mind.